In 1975 I was in high school and ready for my first car. My parents wouldn’t buy me one, but said they would lend me the money and I would have to pay them back with interest. 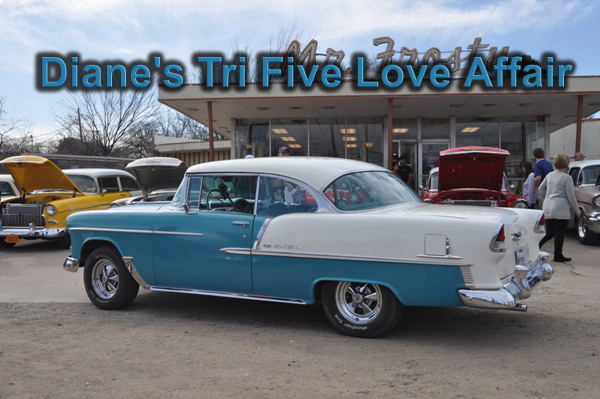 I said okay and I found my first ‘55 Chevy which was really a body on wheels. My boyfriend at the time put in a motor, transmission and new tires. Even though it had no inner wheel wells and I could see the road I loved that car. I drove it for two years pretty much like it was. I had to give it up because in 1977 I moved to Pennsylvania and couldn’t take it with me so I ended up selling it. While I lived in Pennsylvania I found a black ’57 Nomad which was complete and I drove it every day. My husband and I moved to Texas in 1979 and divorced in 1984 but I kept the car in the divorce. My new boyfriend replaced the motor and in 1989 I dumped the boyfriend, sold the car and moved to California. In 1993 I moved back to Texas and met Jerry and together we found our ’55 Bel Air. It was complete and all original. We went to a few car shows and started to lose interested in those so we found others that just wanted to drive their car and not show it. We put BF Goodrich tires with Cragar wheels and disc brakes on the car and off we went. On one of our trips, on the second day we were in the middle of nowhere Oklahoma and the clutch breaks. We discovered the clutch bracket weld that had held for 60 years decided to break where there was no cell service and not a house or tumble weed to be seen and of course with all the spare parts we had, no one thought to pack a welder! One of the members of the group drove on ahead and found a Napa store and they said they could fix it if I could get it there within 30 minutes. Luckily, someone packed tow straps and we made it in time for him to weld the bracket doing a great job. When I asked how much, he said $10.00. I thought he was kidding but he was serious, so I paid him the $10.00 with a nice tip. After that we were back on the road and finished our trip without any more breakdowns. We still love cruising in our car to this day.